Social etiquette can be challenging even in the most controlled environments. Luckily, there are plenty of guidelines out there for properly conducting yourself at dinner parties. But what if your life doesn't revolve around seven-course meals and country clubs? What if getting through your day involves crowded buses, long lines, public restrooms, and randomly placed landmines of dog s**t? Maybe you're new to the city, just visiting, or you're a native. Whatever the case, it's tough to know all the proper rules of society in the battle conditions of modern urban sprawl. After all, good manners require the awareness that you are not the only person in the world, and that can be hard to do when you're just trying to get through your day in one piece. But acting like a human being isn't as hard as you might think. 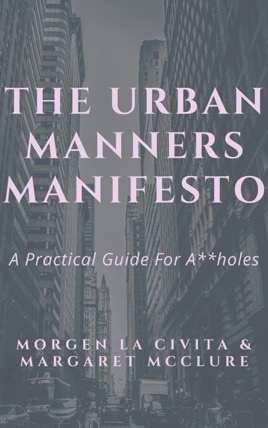 In this handy little book, Morgen and Mags tell you everything you need to know about urban etiquette. They lay out the ground rules of the do's and don'ts in a way that's fun, fast and full of info easily understood by everyone - even a**holes. Thinking about grabbing a lamb kabob before getting on the bus? Wondering if hitting on that hot one sitting next to you on the subway is a good idea? Not sure if cleaning your ears can wait until you get home? Confused about whether you should you flush the toilet after using it or leave it there as a way to mark your territory at Starbucks? We've got you covered! We're going to help you with those tough decisions and get you acting like a responsible member of society in no time. Join us for some personal anecdotes, practical advice, and some very gross pictures. Great book! Short, witty and leaves you wanting more. Highly recommended.